This year wedding season, Todich Floral Design’s January wedding flowers are trending: we are delighted to bring together a range of winter wedding floral designs and London wedding flowers, using a combination of warm and frosty colour palettes for an effect that is nothing less than magical. These winter blossoms and varied floral textures are sure to transform your wedding day into the one you’ve dreamed of! January wedding flowers fall into a wide range of styles and categories. They can be distinguished by their different interpretations of “winter” and emphasis on particular theme and type of wedding décor selected by bride and groom. Ultimately, even the bride and groom’s personalities, as well as the venue where the wedding reception takes place, will influence the style and design of every floral arrangement, for January wedding flowers and all the year round. London events florist Todich Floral Design specialises in a variety of wedding flowers and styles. Many brides choose winter wonderland themed weddings that incorporate lots of crystal, rhinestones, neutral tones, white shades and blue tone blossoms, and even “snow” covered branches as table centrepieces. New Year’s themes can be brighter, even regal or majestic. Winter bridal bouquets for this more outrageously festive theme might combine red and purple roses, gold and white or silver satin ribbons, and colourful beads or strings of pearls to decorate the venue and tables. There are still many other and nuanced vintage wedding styles, winter garden design and rustic wedding décors, equally popular throughout the winter and rest of the year, which tend to be simple but no less elegant. Alternatively, cheery modern or chic contemporary designs incorporate multiple tiers of flower arrangements and glass centrepieces in elaborate design, flashy or bold, and frequently bright in their creative use of floral combinations. Lots of these more contemporary designs provide flamboyant contrast between blossom colours. These wedding colour schemes might rely on combinations like smooth pastels on white, various shades of pink and yellow, or black and white contrast. A top design and wedding theme idea by some of Todich Floral Design’s best London florists is the mocha rose wedding theme, which stemmed from the idea of blending escalated light and dark shades against each other for an overall elegant effect—but this January bridal bouquet definitely brings some of it’s own pizazz. The peach spray roses, cream, ivory white, soft browns and pale, very delicate yellows blend together in such a way that when the bride holds them close they appear incredible, flush and vibrant, as they stand out against her dress. Glossy satin ribbon and pearl accoutrement make this a special favorite among winter bridal bouquets and a modern classic in wedding design. Because of the varying shades, shapes and sizes of the roses used, the mocha rose design is just as wonderful to wear for the rest of the wedding party. 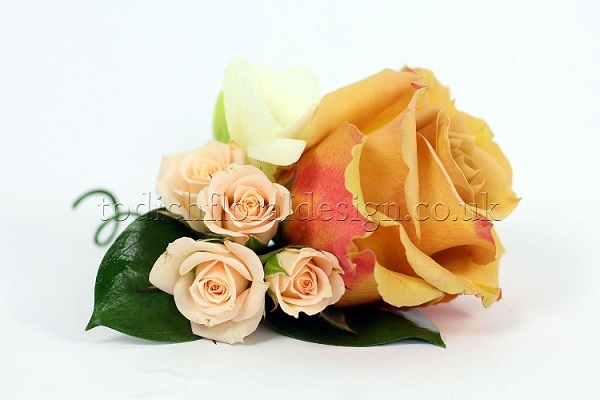 The groom might opt for a boutonniere of one large cream rose, with freesia and peach spray roses for accompaniment, while bridesmaids and other guests can choose from buttonholes, wristlets, and winter wedding corsages. Winter wedding flowers are about balance between cool and warm tones, the blend of different blossom shapes, foliage, and textural contrast. Each floral wedding design is uniquely arranged and brings in different wedding bouquet ideas. In order to come up with January bridal bouquets that are exciting and new for all of our brides, the Todich Floral Design team has a lot of fun developing ideas its own ideas, based on experience and wedding trends for a given year, but then also sits down and seriously listens to the bride for her own ideas and preferences. Expert bridal consultants are apt to ask questions like: how do you envision yourself at your wedding? What types flowers do you see? What does your dress look like? Which patterns and designs stand out most on your wedding day? So, what are the key colours, blooms, and textures that go into one of our January bridal bouquets, as well as any of our new January wedding corsage and buttonholes? Every flower should be fitting with the wintery landscape, the bride’s preferences (her desired “feel”), and wedding theme. Because every flower carries with it an individual meaning and unique connotation, arranging different flowers together has the potential to create something that is thoughtful, artful in the shape of the flowers and the way they are placed within the bouquet. When the florist is finished, you have a bouquet that can speak volumes. Winter wedding flowers speak to love, of commitment, and mirror the sentiments and sensations of the season. And of course they say something about the beautiful bride, too, as she walks down the aisle! One of our Todich Floral Design’s most beautiful and diverse January bridal bouquets alternates white roses and white ranunculus for a multi-textured and multi-hued white floral profusion, then adds peach spray roses and blue muscari for their pastel colour, contrast, and delightful scent! Eucalyptus leaves to frame, then a white satin ribbon and a few pearl pins in the right place—and you are holding one of the finest winter wedding bouquets. For bridesmaid bouquets, warm floral contrasts and a mixture of distinct and same blossoms are the perfect backdrop to the bride’s own bright, white bouquet. Sweetly scented magenta roses are the feature in some of the best London wedding flowers. In addition are smaller buds like peach spray roses and pink ranunculus dotted by blue muscari and green eucalyptus. 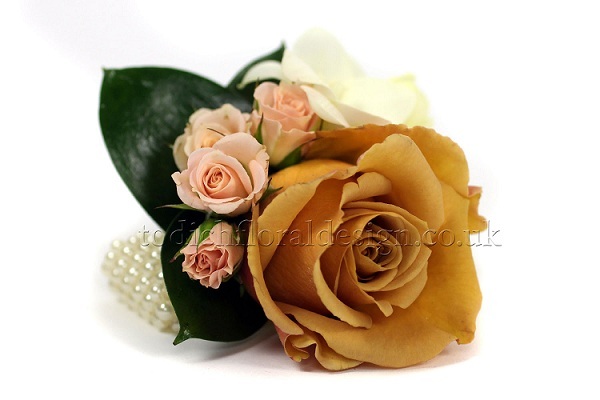 A miniature version of this January bridal bouquet makes a fine winter wedding corsage or buttonhole. White Ranunculus are one of the premier January wedding flowers. Their soft white heads, made up silken-thin petals arranged in heavenly little whorls, make the perfect feature of any January wedding bouquet. Joyful in many seasons, in January ranunculus are especially reminiscent of fresh powdered snow and clean, pure sunlight reflecting off a white-blanketed landscape. They are one of the most delicate and also versatile of winter wedding flowers. Not only are ranunculus ideal in January bridal bouquets, but their tiny little stature makes them well-suited for a variety of floral designs, in winter wedding corsages and buttonholes, boutonnieres for the groom and groomsmen, as well as elaborate winter-themed centrepieces. Pink shades, blush, yellow-tinted and cream hued ranunculus are other popular twists on the already popular white variety. White Lilies are a traditional and mythological blossom with a heritage that stretches back to Greek mythology. The lily’s symbolism is rooted in attributes of chastity, virtue and purity—perfect for winter wedding reception flowers and celebration of bride and groom on the happiest day of their lives. The flower’s star-shape and flared-edge petals augur of a promising future for the delighted couple as they begin their life together: full of strong long-lasting friendships, mutual devotion, and prosperity. Peach Spray Roses are the darlings of January wedding flowers, adorable as buds or slightly larger, a layered maze of soft petals; it’s easy to get lost in any one of our winter bridal bouquets that use them! Their subtle but sweet kiss-me-pink accents help to add a touch of pastel balance and warmth in some of the all-white or blue-tone January bridal bouquets, or if things are already a little heated by red and magenta roses, the pink tone suffuses a lighter shade through a rather intense bouquet colour palette. Peach spray roses make some of the most stunning winter wedding buttonholes, as well as winter wedding corsages, that combine blush pink ranunculus, a large head magenta rose, blue muscari and eucalyptus accents. 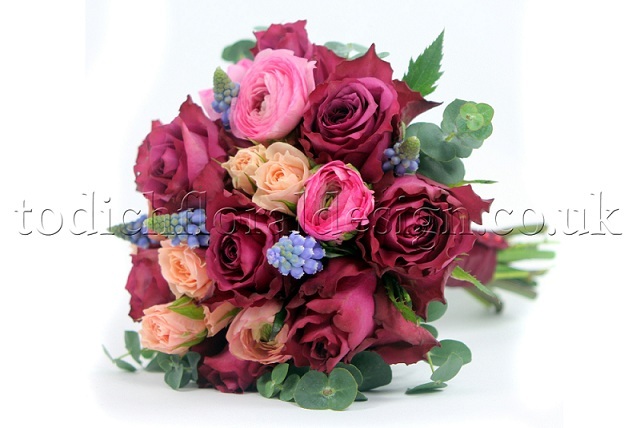 Magenta Roses are flowers after any woman’s heart, and all of our brides and bridesmaids love these brilliantly warm, magenta coloured roses that flourish right in their hands, clutched within their beautifully arranged bouquet. Magenta roses command a bold kind of beauty, and are well balanced in combination with peach spray roses or adorably pink ranunculus. The rose, being a classic symbol of love and passion, is classy and need not be refined. It’s a gorgeous component in any January bridal bouquet and works equally well in winter wedding reception flowers with vintage, rustic, modern or flamboyant-contemporary themes. Blue Muscari are many tiny, pale blue bulbs, a soft and sweet touch on any part of this season’s fantastic array of London wedding flowers, whether it be bouquets, corsages, reception flowers or winter wedding buttonholes. Also known as baby’s breath and bluebells, blue muscari can sometimes look like miniature grapes, and do bring with them the fresh, sweet fragrance of spring. These little buds appear like a promise in an otherwise wintery landscape! This is the part where we help you make your dream-wedding venue become reality. Our top London florists, wedding designers and creative talent get together and transform your wedding hall, traditional church wedding, or any venue you desire. We use wedding theme decorations, input from bride and groom, and the 2015 wedding season’s floral design trends in this recipe for matrimonial magic and delight. Wedding flower delivery service from Todich Floral Design includes full, professional installation of flowers for any style, theme and wedding decorations. Over 15 years of experience has Todich Floral Design prepared to address every aspect and detail of your wedding—and come up with just the right flare when it is necessary. Expert wedding florists, designers and consultants apply their magic touch to fishbowl and glass vase centrepieces, tabletop flower arrangements, church pews and front reception areas, floral runners, chairs and place settings. They know when to string daisies, apply bright clusters of hydrangea, or drape a vine from a column or bannister. Is a corner looking somewhat bare? They just may recommend some Queen Anne’s lace. As a leading wedding florist and floral designer of London wedding flowers and flowers throughout the UK, Todich Floral Design caters their floral designs to all faiths, religions and cultures. In the past, our florists and design team have worked together to create stunning bridal bouquets and winter wedding reception flowers for Christian wedding receptions, Jewish weddings, Hindu wedding designs, Muslim wedding flowers and Sikh weddings, among others. Our purpose at Todich Floral Design is to transform your wedding day into a gorgeous event, no matter where or with whom. We’ve been delighted to work with clients planning either interfaith or Civil Partnership ceremonies. We provide design and decoration needs across various faiths, different religions and all types of ceremonies. If you need winter wedding flowers and floral arrangements for a church wedding, weddings in a synagogue or mosque, as well as agnostic wedding ceremonies, then Todich Floral Design has ideas and the experience to assist you on planning your wedding day to perfection. It’s important to check up on whether or not the flowers you’ve chosen are in season. In December, January and February it’s a good idea to do some research (or better yet, plan to have a bridal consultation with one of Todich Floral Design’s leading florists! ), and explore what is readily available, reasonably priced, and currently in season for winter. Some popular in-season winter flowers for January bridal bouquets and other chilly months are lilies, sweet peas, ranunculus, amaryllis, forget-me-nots, and tulips. There are others, of course; by reaching out to Todich Floral Design to arrange for a quote and see just what lovely blossoms are available you can demystify the flower market—and the associated price tag! As a wedding florist, Todich Floral Design is creative, highly flexible and able to work with a range of budgets for wedding flowers.